Charles DeLong built the house on ranch land along the Mann Brothers’ Trail, which ran from Mariposa to Wawona and on into Yosemite Valley over Chowchilla Mountain following old Indian trails. Meadow Creek Ranch became a stage stop for wagons and coaches carrying supplies and travelers into Yosemite and Mariposa. First known as White and Hatches and run by James H. Hatch and his uncle Dexter White. Later run by Delong and then by the next owner, Turner. White and Hatch had been cutting lumber in the area, and in this year they built a good sized two saw circular mill on Delong Creek, 400 yards north. According to the Mariposa Gazette of January 28, 1862, most of the timber was cut off of government land which could be cut by anyone. But when they started cutting on DeLongs’ 160 acre claim, he wanted them to pay him. They refused, so DeLong drove a harrow tooth into a tree. When they cut it down a few days later and hauled it to the mill, it wrecked a $600 saw. Wellman, Robinson, and Ed Hale were the successive owners, with Robinson building onto the house in 1884. Richard and Emma Bays bought the property. The Richard Bays Family History includes stories from those days. Traveling by horse and wagon had been slow and the 9 of their children complaining about the heat and dust. When they were a mile away from the house, to keep up their spirits Richard told the children, “We’ll buy the first place we come to that’s for sale”, and they eagerly ran ahead to see their new home. 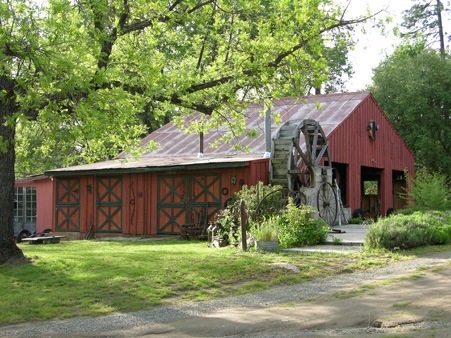 It was operated as a farm to support Richard’s dairy herd and horses. The prized milk cows furnished milk and butter to many area families, and he was known for the well trained teams of horses he raised here. Richard was also known for his extensive first aid training, and was often called on to administer to people and animals needing medical help. Helen Pickering Ashworth relates how, when she was nine years old and living near Stumpfield Mt. Rd. and Boot Jack Rd. (now Hwy 49), her father had a heart attack and she was sent to get Richard. He attended to Mr. Pickering and comforted the family until the doctor arrived several hours later. By this year, the Barker’s had financial problems, and the ranch reverted to Richard Bays. He moved part of his family back here to grow feed for livestock. In December, his daughter Queenie watched from the upstairs bedroom on the left for George Ashworth to arrive. That night the young couple ran off to Madera to be married. Sold to E.A. and Katie Hilton who did repairs to the house and stuccoed it, adding the ornamental target circles to the front and the porch. When this porch had to be replaced in about 2000, it was discovered that the “bull’s eye” of the circle was a black marble belonging to the nephew of the plasterer. He got his marble back 70 years later! The few pictures of the house in existence are of this period, including one of Katie, their adopted daughter Margaret, and their son Jim wearing goat chaps, with some of their goats. Owned by Hahn, Odell, and Olinhouse. The Odell’s ran a Dude ranch here for wealthy kids from San Francisco. Clifford and Clara, two children of Florence Bays Wass, worked the ranch taking 12-15 campers horse back riding on the property. This may be the period when the house was electrified, with on top of the wall wiring. It’s also unknown when the house received indoor plumbing in the room that formerly held the Well’s Fargo safe. Harvey and Thelma Crose gave the home its name, Meadow Creek. They moved here for cattle ranching, and were advised by the realtor to tear down the tired 100 year old house. Fortunately, they began to fix it up instead, building on closets, and another bedroom and bath behind the kitchen, and deepening the shallow firebox of the fireplace. During their 20 year ownership, Highway 49 was extended south of Mariposa. This changed Boot Jack Rd. (the old county road from Mariposa) into the current driveway. The right of way for the new Highway 49 caused the 3 old barns to be torn down, but one of them was rebuilt in its current location behind the house. The top of the largest barn had held many barn dances over the years. Mike and Nancy Hubert were the next owners and the first to make Meadow Creek Ranch into a Bed and Breakfast. The 3 small upstairs guest rooms all shared the one downstairs bathroom, which was common in that era of BandB’s. They also converted the old chicken coop into a private cottage with its own bathroom. Bob and Carol Shockley bought the BandB and used their talents as artists and Bob’s profession of architectural designer. They replaced the single window and door of the dining room with large picture windows, modernized the kitchen, and did extensive interior design and landscaping. Over their 13 year ownership, fewer BandB guests wanted to share a bath, so they walled off the back bedroom and bath, creating a new patio entrance for the “Garden Gate” room. The water wheel was a high school project that was moved here for decoration. Mark (Willie) and Diana Wilcoxen came to Meadow Creek Ranch with our 12 year old son Jesse. We have continued its stewardship with reroofing, remodeling all 3 bathrooms, (none of the claw foot bath tubs are original but were added to look “period”), building 2 new porches, shoring up the barn, and decorating with Willie’s metal art and old car parts. After a skunk decided to live under the house, we had part of the foundation rebuilt. The old foundation was huge rocks, now moved to the garden, and the cornerstone is a tip of granite rock like the tip of an iceberg. Like the previous 3 owners, we came from big cities with big adjustments to rural life, but have loved living in the country. It’s not nearly as remote as it was 150 years ago, when the other end of Triangle Rd. was like another world. Still, it is not so different now. When no cars are going by and you hear nothing but birds, when I woke up the first morning to see a heron in the yard, when it’s a new moon and you can see the Milky Way, when you remove the stucco to find 1897 newspapers on the old plank walls, then you can imagine it’s still 1858. People still come from all over the world to see Yosemite and stay at the old stage stop at Meadow Creek Ranch.